Before the year end, I really and I mean really want to establish my blog and this means getting a few sponsored posts under my belt and working with fellow bloggers for some great collabs so we can help each other launch ourselves into the blogger stratosphere. I've been really busy doing research and decided to reach out directly to as many lifestyles and beauty businesses locally in the UAE and globally. Love to work with some brands for sponsored posts and just finished my media kit to make this ambition a reality. We've just got back from our holiday in the UK which was amazing. The weather was exceptions and three weeks of winter sun and crisp autumnal days!!! We did so much and tried to visit as many places as humanly possible in the three weeks we were home, please do check out my visual diaries part 1 and part 2 to see what we go up too! 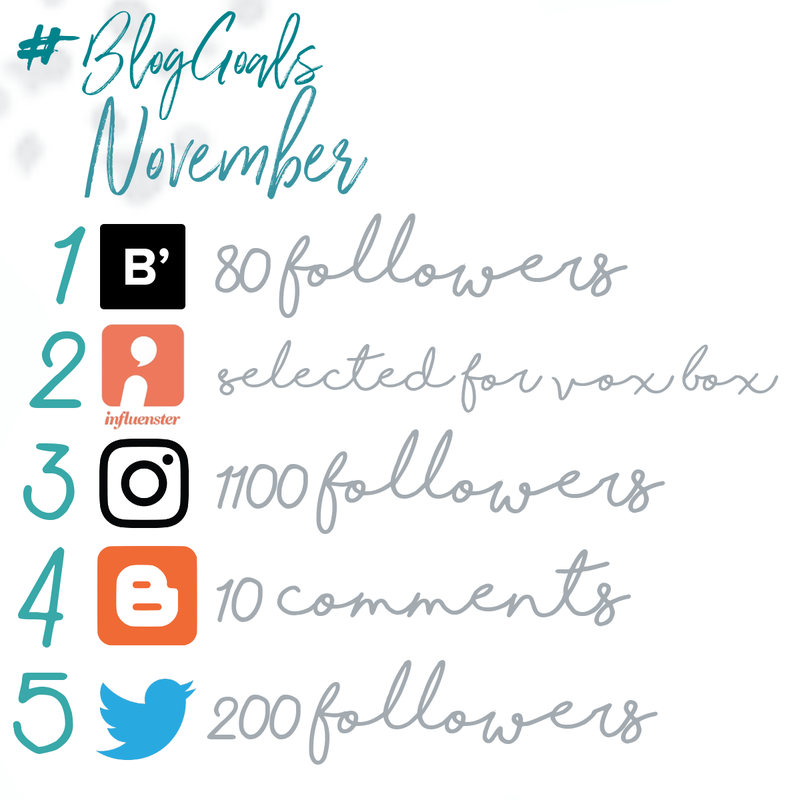 My bloglovin' count has gone from 1 to 65 in the month of October, to where it currently stands at 84. For the rest of November, I want to keep increasing this number as much as possible and aim to reach 100 followers by the month end? So I am slowly but surely getting there, I have raised my Instagram game by posting on a regular basis and increasing my followers. I'm an avid photographer and am looking to get a good theme in place and continue to break the 1000 mark! My Instagram is looking much healthier and currently at the 1045 follower mark, so definitely can make my goal of 1100 by the end of the month but there is no stopping me and this will just keep expanding this goal so I can continue to push myself. To be honest this is going slower than anticipated. For a little while, I was achieving this goal and gaining contact from fellow bloggers/subscribers. I love reading comments and your thoughts on my posts and reviews, but the comments have stalled a little bit, so, my focus on the rest of November will be to increase my commentary engagement on my blog, I'll be making sure I follow/subscribe and comment as much as possible to get noticed and build solid friendships with fellow bloggers! My Twitter following has increased 10 fold since I began my blog and my following currently stands an 135. I think 200 is achievable and although I was a little quieter when away on holiday, this months drive is aimed and ensuring I stay engaged and active, as this is an amazing platform that I would love to crack. I've been thinking about this for a while and want to theme/rebrand my Instagram. It's an amazing platform and living overseas in exotic middle eastern lands, I have so much splendour around me to showcase. I need to crack Instagram so armed with my new iPhone 8 plus I'm determined to get this goal ticked off. Stay tuned for an Instagram rebrand shortly. I am constantly looking to build a lovely friendship base of fellow bloggers out there in the big blogging world. I am looking to follow and post on similar blogs to strengthen my brand. Please do follow me and my social media links are dotted all around my blog. I'm always looking to make new friends and so please do come back and subscribe and comment and I'll enjoy following you back. What do you think of my November goals and What are you're working towards this month? What are you're working towards this month?